At LIBERTYAIR, we provide installation, maintenance and repairs on all types of cooling appliances, including ductless air conditioners and mini-split air conditioners. We understand that the heating and cooling needs of each home can differ, so a traditional central air conditioning system may not be best for your home or family. We value the satisfaction and comfort of our customers and will always strive for perfection. Count on LIBERTYAIR for ductless and mini-split air conditioner services. Mini-split air conditioners are often an ideal choice for property owners or homeowners when large heating and cooling systems are out of the question. Ductless air conditioners can target and cool individual rooms without sending your energy bills skyrocketing. In fact, ductless and mini-split A/C units are extremely energy efficient since they only cool the immediate area. While central heating and cooling systems are very popular, they are not always efficient or convenient. Ductless air conditioners provide several advantages over central air systems, which is why many people still rely on them. Cost effective. Ductless air conditioners cost a fraction of the price of central air systems, and it’s less expensive to install, service and repair these units. Energy efficient. Rather than heating or cooling an entire home or building, you can target individual rooms with energy-efficient ductless air conditioners. This allows the room to cool more quickly and stay cool longer. Quiet. Mini-split air conditioning systems are extremely quiet. Low maintenance. With no ducts to clean, repair or replace, ductless air conditioners require much less planned maintenance than central air systems. Air ducts should be cleaned at least twice a year, so you’re already saving time and money by choosing a ductless system. No leaks, no mess. Without ducts, there’s no need to worry about leaks and the damage leaks can cause to your home. Temperature control. Not only can you control the temperature of the room with a ductless air conditioner, but you can also control the level at which the unit cools. By adjusting the amount of refrigerant used, you can extend the life of the unit. Ductless air conditioners are commonly used for small homes, apartments and condominiums, as well as garages, sheds and room additions, and they are perfect for keeping your home cool during renovations. In order to heat or cool larger areas, multi-zone ductless air conditioning systems are available. These systems are designed to heat and cool areas larger than a typical room size and can be used in areas of the home that are not easily closed off. In areas of the home where ducts are not feasible, we recommend choosing ductless, mini-split air conditioners or heat pumps to heat and cool your home. Ductless split systems include a condenser/compressor outdoor unit and a small blower/evaporator indoor unit. The ductless blowers are lightweight and easy to maneuver, and they fit in the tightest of spots where other heating and cooling units cannot go. Ductless units are much more presentable than window units, and of course they can cool windowless rooms, garages and outdoor sheds. Demanding residential and commercial spaces are no match for an efficient, effective ductless air conditioner. 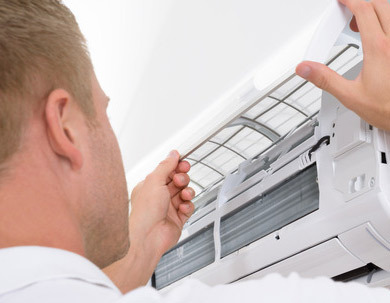 Contact LIBERTYAIR for all of your ductless A/C installations, maintenance and repairs.